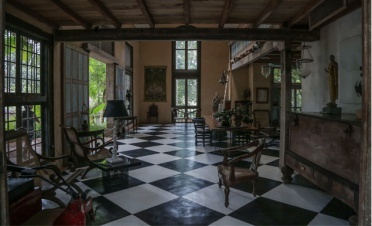 The Villa Bentota is one of Geoffrey Bawa’s masterpieces, created over 50 years ago when he converted it from an ancestral home into Sri Lanka’s first ever boutique hotel. In 2007, celebrated designer Udayshanth Fernando made many improvements and extensions: taking care to respect its original architecture and design, it is now a seamless blend between the old and new, with the rooms and bathrooms in particular receiving a contemporary upgrade. This chic hotel has 15 stunning individually-designed rooms and two swimming pools – guests can enjoy modern amenities and the rustic charm of olden-day Ceylon. Choose from five different room categories. Most have a balcony, terrace or courtyard and feature a unique layout and décor. Best suited for single travellers on a budget, Single Rooms have a comfortable single mattress, mosquito net, wardrobe, drawer, ensuite bathroom with rain-shower and a small balcony that looks out to the pool and sea. These delightful sea-facing rooms open onto the garden or come with a balcony and feature a king-sized bed and modern amenities. These elaborate and sumptuous suites are a true delight, complete with balconies facing the sea and garden and private lounge spaces including exclusive courtyards. Spacious, secluded and open-plan, these suites are perfect for honeymooners and couples. Whilst the Executive Suites offer plenty of extra room, they do not come with any sea or garden views. They do however offer the upmost privacy. The double suite on the ground floor is the only room with a private courtyard complete with a plunge pool. A special room ideal for larger groups looking for a touch of luxury and class, this suite is reminiscent of the Dutch period and has original, vintage furniture including four-poster beds and chairs. Persian rugs adorn the floor of the lounge, and the two double rooms (one king-sized, one queen-sized) share a magnificent bathroom. The Villa Café has been setup to go hand-in-hand with the delicious menu on offer at The Gallery Café in Colombo. 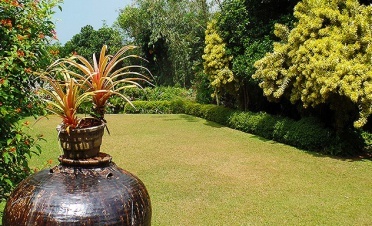 You can opt to either dine here or at one of the many picturesque spots in the garden. In-room dining is also an option. Particular highlights are the pizzas and exquisite desserts. Naturally, rice and curry and tea in true Sri Lankan style is available. There is a family suite, spacious garden and a large swimming pool making it suitable for children. Older kids can enjoy fun water-sports such as water-skiing and banana-boating on the beach.